SPRUCE Upholstery Designer Spotlight Series: Chris McCray of McCray & Co. Designer Spotlight Series: Chris McCray of McCray & Co.
We love working with Austin’s most creative and talented designers. One of our favorite creatives is Chris McCray of McCray & Co., a designer who has natural talent and a persistent salvaged DIY aesthetic. His creations are always fresh, soulful, and inspiring. We’ve had the pleasure of collaborating with him in the past, and we’re excited to spotlight him for this month’s Designer Spotlight Series. 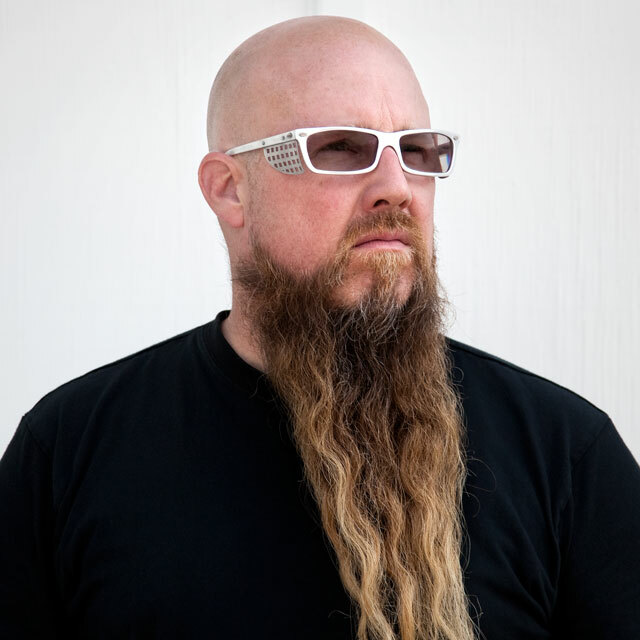 Without further ado, take a look at our interview with Chris! Portrait photo by Ryann Ford. Glasses design by Chris McCray. Church. When I was growing up, I was required to sit through church every Sunday, every week of my life. As a rambunctious kid who would later be diagnosed with ADD, I was bored to tears. I would take a pencil and draw all over the church bulletin, copying down every architectural detail I could see in the place – every angle, every line, whatever I could think of to get me through the interminable 30-minute sermon. I guess it just sunk in. How would you describe your work process, taking something from an idea to a fleshed-out, finished product? It usually starts with the flash of an image – something I see on the side of the road as I drive by, a picture that streaks across the screen on my laptop, or a thought that I have late at night before I go to sleep. Some of those things manifest into sketches, some of them collide with each other before making it onto paper, and a lot of them lay dormant until a later date. But once they make it onto paper, they become malleable ideas that continue to be layered upon until the design feels right, or it just gets too damn late. I typically design furniture and spaces with a fabricator in mind, and a large part of my design process takes place in three dimensions. I have a personal belief that there are far more objects in existence than there really ought to be, and the act of simply specifying goods which were manufactured in and shipped from faraway lands is a practice that I try to avoid as much as possible. Working with local makers and existing/reclaimed materials becomes just as important as that original spark that caused me to put pencil to paper. Everything that I do is a collaboration, whether it’s with the client, the maker, the people who work with me in my office, or the materials themselves. 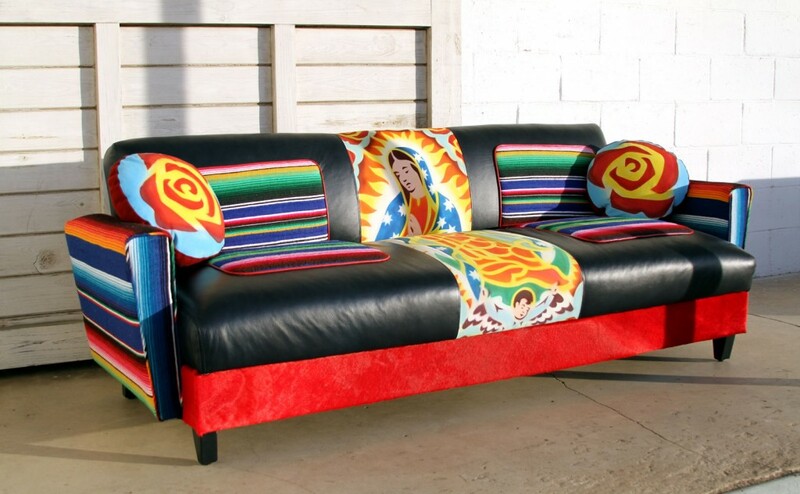 You collaborated with us on the Our Lady of Guadalupe sofa (above), which is a completely unique piece that includes a custom screen print and upcycled materials. Can you tell me a little bit about the piece? Where did you get the inspiration for it? The Our Lady sofa was inspired by the client, who asked me to interpret Austin from a South Congress perspective. I’m a big fan of the work Federico Archuleta has done all over town, but one of my favorite pieces is the Lady of Guadalupe he did across the street from Guero’s. My favorite time to be on South Congress is when the Continental Club is sponsoring a hotrod show, which made me think about the old-school tuck and roll upholstery, done up in the bright, funky serape fabric that we see so often here in Austin. And then we skirted the whole thing in red cowhide because, hell, it’s Texas. 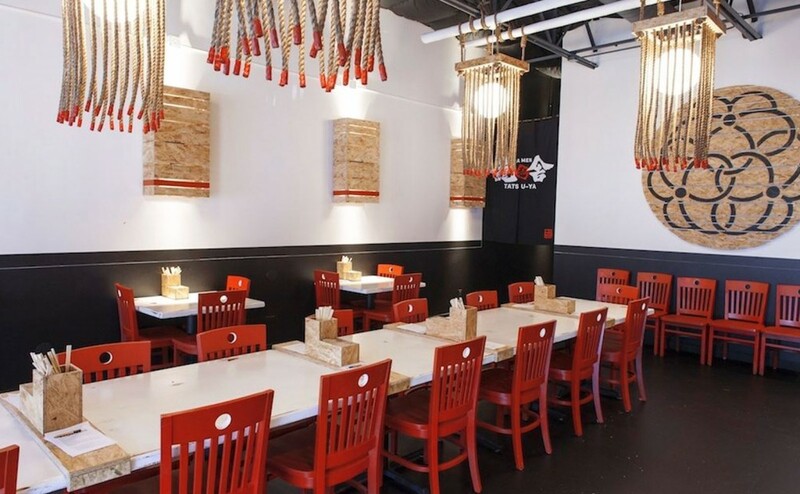 Your company is pretty prolific, but you’re probably best known for designing some of Austin’s favorite restaurants, including Ramen Tatsu-Ya (above) and Lenoir (featured photo, taken by Ryann Ford). 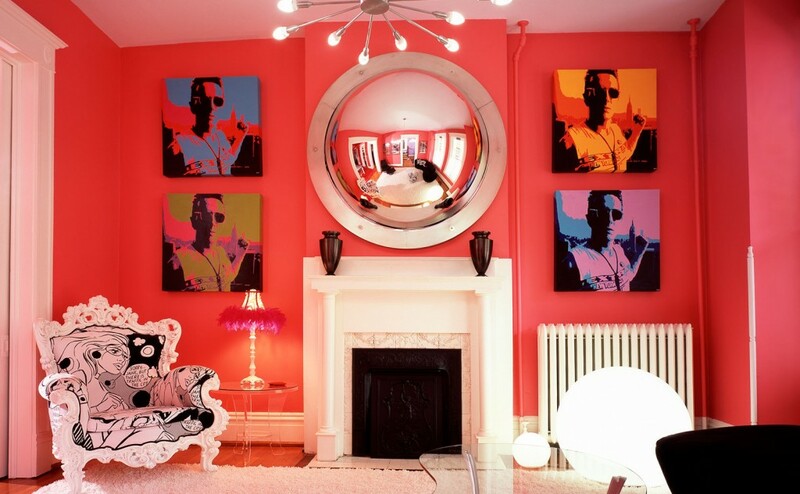 What is your design philosophy for creating memorable spaces? I think as designers, we are obligated to tell a story in the space. If it’s a good story, it’s memorable. And all good stories are unique. It’s all about storytelling. How have you seen the landscape of Austin’s design change since you moved here in 2011? I feel like when I arrived just a few short years ago, there were only a handful of people that were making what I consider to be thoughtful work. Now, with so much growth happening at such a fast pace, there’s interesting work going on all over the city. The bar has been raised on design and experience expectations to the point where we are now having conversations with clients about staff dress and the type of music that they’ll play. Not sure these were topics covered in design briefs here four and five years ago. 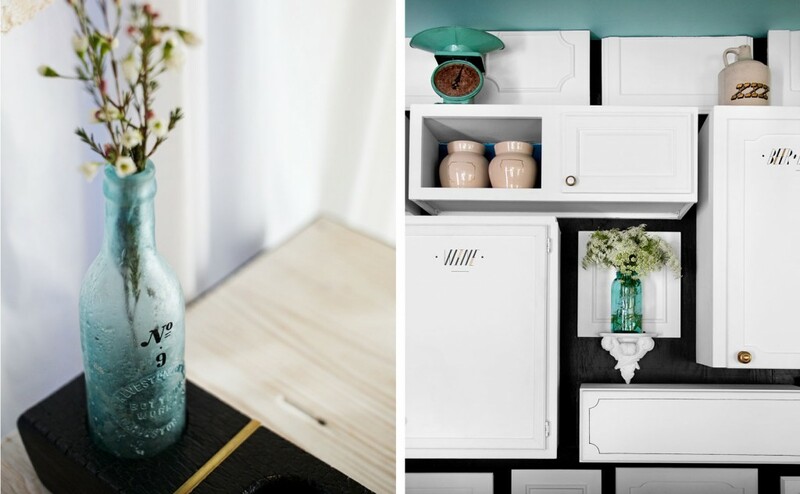 What would be your dream design project if you had an unlimited amount of money and time? I hate the idea of having unlimited money and time. I truly believe that if that were the case, it would be an extremely hard project to take on. For me, design is about parameters and what can be done within those parameters. Without the parameters, it just feels hedonistic. But as far as my dream project goes, I’ve always wanted to work on a boutique hotel. What can we expect from you and your business in the next year? We’re really excited about what the next year has to bring. We’ve got a few more restaurants up our sleeves; can’t wait for those to be revealed as they move forward. We’ve got a few commercial clients that we’re working with on exciting projects. And we’re starting to venture more into the residential world here in Austin, which I really like. We’re also working on prototypes for a new furniture line called Mable. Stay tuned, it’s going to be a good year. Photos of Lenoir by Jody Horton. The first project that comes to mind is Lenoir because it’s the first project I worked on when I arrived in Austin. 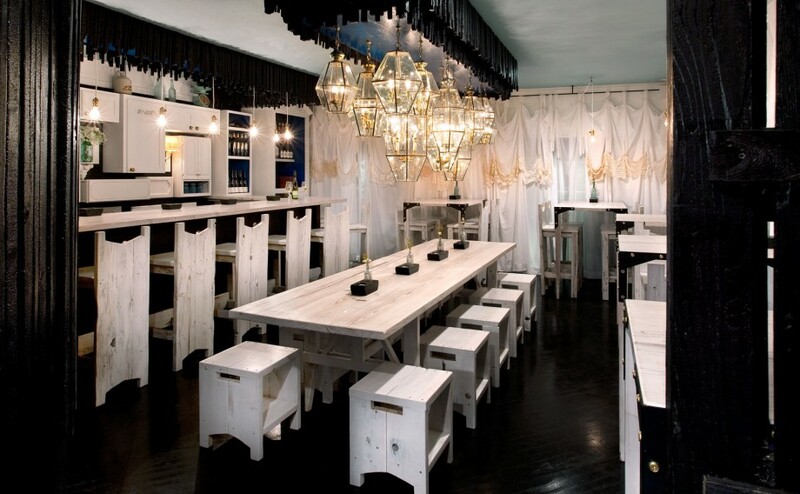 The materials we used to build out the space were scavenged, upcycled, or reclaimed. It was my only project at the time, so it allowed me the time to work on-site and get to know some great Austin makers, like Jesse Hartman, and Andy and Pearly Rihn. 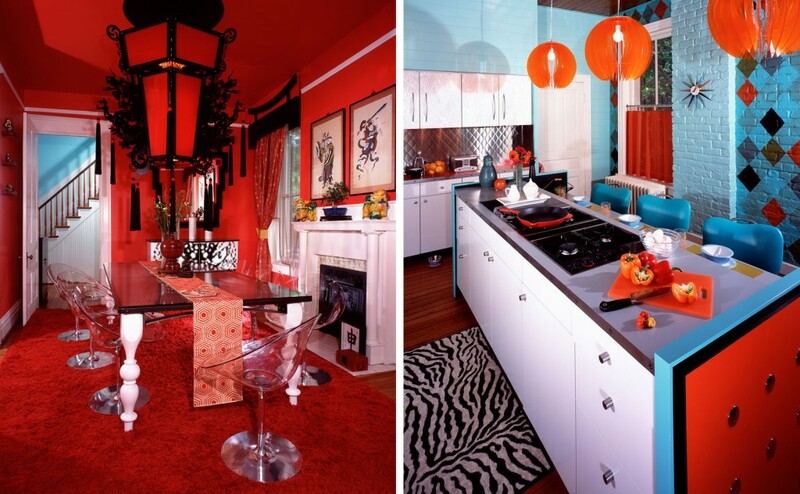 One of my favorite residential projects I’ve done was for a record producer and his wife, which started with a very simple design brief: make our house as colorful as the Simpson’s house, and make sure Godzilla is present in every room. As you can see by the photos, I think we accomplished these two tasks. Photos (above) by Lee Brauer. Recently, we worked with the creative and marketing team at Tito’s Vodka to help them out with the design and build of their new offices. I got the chance to bring in and work alongside one of my favorite Austin makers, Adam Young of Old Crow Custom Works. The majority of our resources came from decommissioned bottling equipment, which we picked through and selected from the manufacturing graveyard out at the Tito’s plant, as well as pine planks that were salvaged from the devastating fires in Bastrop. 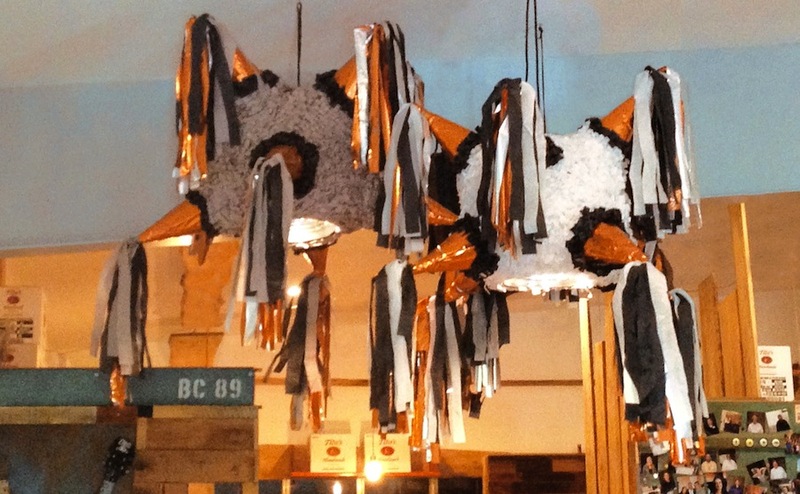 One of my favorite details is that I got to work with a pinata maker over on Cesar Chavez to create three pinata chandeliers, using the copper foil that everyone’s familiar with from the Tito’s Vodka bottles. Thank you for taking the time to answer our questions, Chris! July 28th, 2014 posted under Clarisa, Designer Series, General.